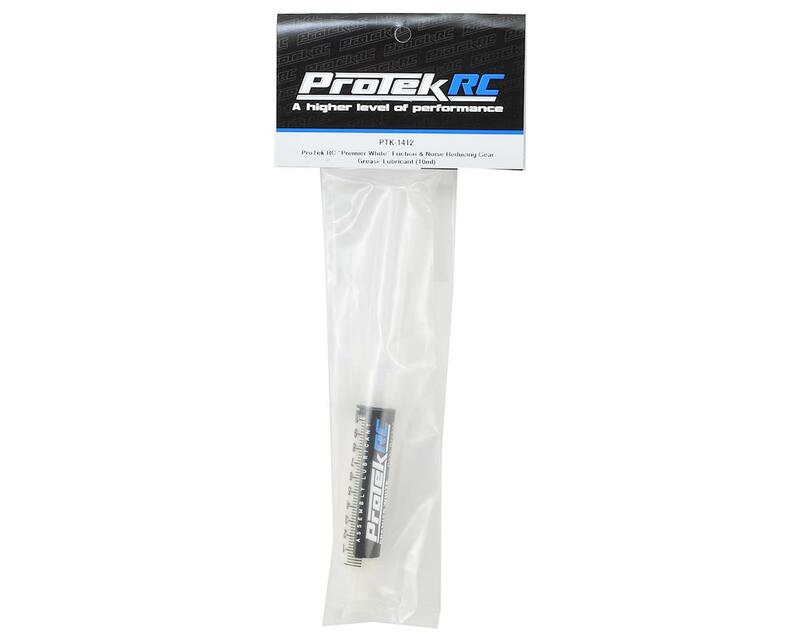 This 10ml syringe of ProTek R/C "Premier White" Friction & Noise Reducing Gear Lubricant that provides super smooth and friction-free performance. It works great in any weather condition, performs throughout a wide temperature range and is safe with plastic and metal. For R/C applications, Premier White is best used with plastic spur gears, 1/10 scale transmission gears and 1/8 differential ring and pinion gears. Testing has found the Premier White helps increase roll-out speed, higher RPM's and increased gear life. To use, simply apply a small amount of Premier White across the width of one gear. As the gears spin, Premier White will spread across all gears and teeth providing a thin layer of lubrication. This also helps reduce gear mesh noise, as well as seat brand new 1/8 ring and pinion gears. 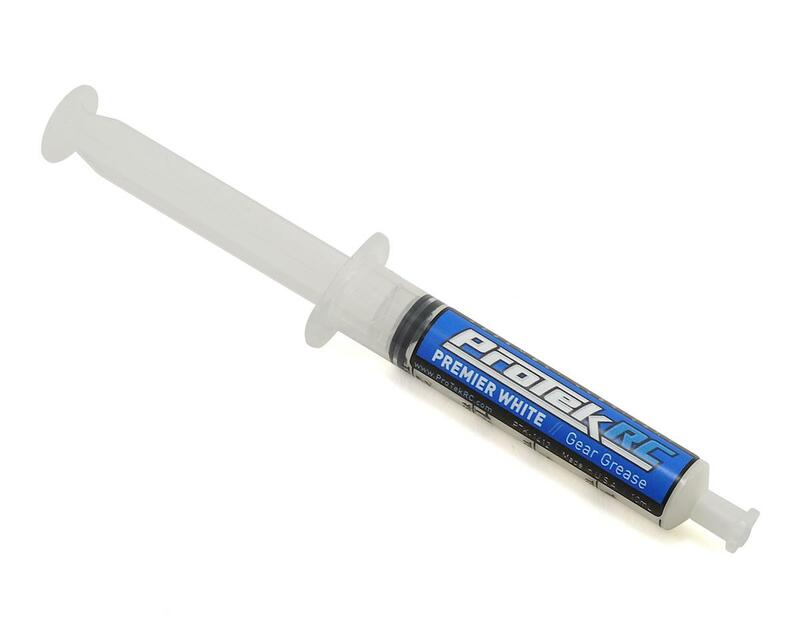 Premier White also works great as a general R/C assembly grease; use it with bearings, servo gears, axle joints or even the threads of a turnbuckle when installing new ball cups. Premier White has plenty of other household, recreation and project uses. Keeping a spare tube in the garage is a great idea when working on cables, chains or even your bicycle. This stuff is really good and although I use Hudy graphite grease for some things and Mobil 1 synthetic (RED) (110% racing blood) in a syringe for others, this Premier white is great for Tekno gears. I wanted to test if it really stayed so I put a "medium" amount on the spur gear, turned my E-buggy on and gave it about 60% throttle. It did dampen the noise but considering it "flung" onto my face, you might want to do it on the track and use a bit less. I also put it on my sons outdrives and drive shaft ends and it really did help. I would bet however that this is made by another company and rebranded but it still is a very good product and the syringe can be used to test other types of grease when you are finished with it. I like it. Work's as advertised! Use it on my KF2 & K2 gear boxes huge reduction of nosie Outstanding product!!! This is great fro a lot of different uses. Always in my box!